Over the years we have featured a wide variety of different smartphone and gadget docks, designed to provide an easy, clutter free way of charging your devices in your home of office. If you have a large amount of gadgets then cables an organisation can be a problem if your desk space is limited. If you have limited space then this modular charging and organisation “Tower” might be worth more investigation. The Tower is capable of holding pretty much any pocket gadget or wearable you need to charge. Watch the video below to learn more. Unlike common charging stations, the Tower won’t limit your charging devices to a small number of ports; this dynamic design allows you to add as many ports as you need. Our team aims to make this product future proof for you! 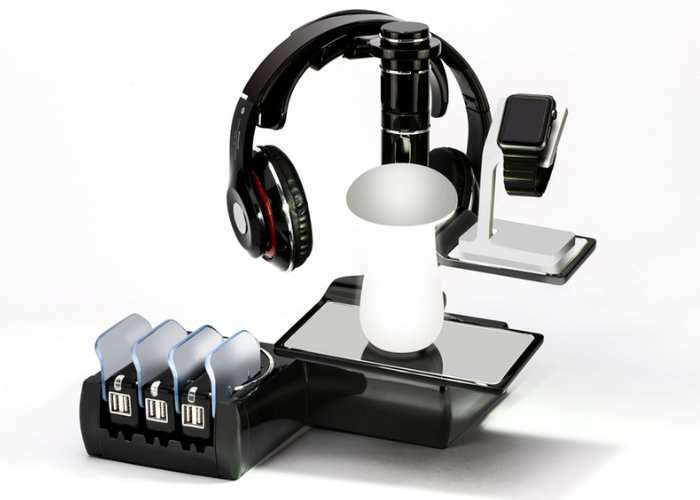 The Tower comes with interchangeable mounts to suit a wide variety of devices; like your headphones, earbuds, smart watch, speakers, power bank, etc.. The charger will automatically stop charging when your device is full. The charger has a light indicator to show you the status. And to those who are “sensitive sleepers”, we have created / added a smart option: light cancellation button” which allows the user to keep charging their device even when the charger light is turned off. Jump over to Kickstarter for more details and to make a pledge from CAD$70 via the link below.